Yesterday, our Wander Across Mexico group visited the town of San Juan Chamula, a community of 95,000 Tstozil Mayans that lies approximately ten kilometers away from San Cristobal de las Casas. And during that visit, yes, we entered what I can only describe as the most amazing church I’ve seen in all my travels. The Tsotzil Mayans live in their own autonomous region in the Mexican state of Chiapas, a region that Mexican police and military are not allowed to enter. These Mayans, in order to maintain their culture and traditions, have extremely strict rules and practices and when any member of the community rebels or doesn’t adhere to these cultural rules, they are expelled, simple as that. In addition, the Tsotzil believe that when you take a photograph of someone, their soul is taken away and so, visitors to the town are generally not allowed to take photographs directly of people, especially any civil or religious leaders. If the local police, who walk around wearing white fur ponchos and holding long black sticks, catch you taking a photograph of something they don’t want to be photographed, the punishment can range from a verbal reprimand to having your camera confiscated or even being fined or tossed in the local jail. And the most sure-fire way to end up in that jail would be to take photographs inside the town’s one church, the Church of San Juan, a simple-looking church that sits at one end of the main square. This church is the center of Tsotzil life as this is where every member of the community practices their unique religion, which is an intriguing mix of traditional Mayan customs and Spanish Catholicism. I can only try to explain what I saw as best I can. But believe me, you really need to see this place for yourself (as is the case with most things) in order to truly appreciate it. The church has no priest. It is open 24 hours per day. Members of the Tsotzil community can enter at any time. When they do visit the church, they walk through the large hall, which has no pews, and they find an empty spot on the floor, which is completely covered in fresh pine leaves. The Tsotzil then set up a variety of candles in front of them, candles of different colors that each represent a specific type of problem that they need to be solved. When we visited, some people had a few candles in front of them and others had almost one hundred, creating a scene in which there were well over 5,000 candles in total burning inside this church. Once the candles are lit, the Tsotzil pray, in their local Tsotzil language, to one of the dozens of Catholic saints whose statues line the sides of the main hall, or to the large statue of John the Baptist encased in glass at the far end of the room. Sometimes they pray for a few minutes, other times for hours on end. They are free to remain inside for as long as they wish until all of their issues are dealt with. Once they have finished their prayers, and especially when they are suffering from a more serious problem, the Tsotzil consult one of the medicine men or medicine women who are wandering around the inside of the church. The shaman comes over, lifts up a live chicken (which the praying Tsotzil had brought with them) and rubs the chicken against the afflicted person or persons. Every now and then the shaman checks the person’s pulse until they determine, through the pulse somehow, that the problem they are praying about has been transferred to the soul of the chicken. Then, the Tsotzil takes the chicken and wrings its neck so that the problem disappears forever. Finally, the newly ‘freed’ individual or individuals take a giant shot of ‘posh’, a local sugar-cane based liquor, and often a long swig of Coca-Cola as well, until they begin to burp. Once they burp, they believe that they have been fully cleansed of the evil that had been haunting them, allowing them to end their prayer session and head back outside. Now, in summary, just imagine an entire church hall, eerily lit and full of Catholic saint statues and thousands of burning multicolored candles on the floor, with dozens of traditionally-dressed Tsotzil families, couples and individuals sitting on a layer of pine needles, praying on their knees, chanting in ancient tongue, drinking homemade booze, burping out loud and killing chickens. The scene was fascinating and I am certain that every single member of our group could have stayed inside watching it for a long, long time. I have never seen anything like it and I’m not sure if I ever will. Again, taking photographs inside this church is completely prohibited and so I have no real proof to back up the above. However, if you ever travel to the state of Chiapas, Mexico, or more specifically, to the town of San Cristobal de las Casas, you absolutely must venture over to San Juan Chamula so that you can also experience this community for yourself. Only then will the above actually seem real. 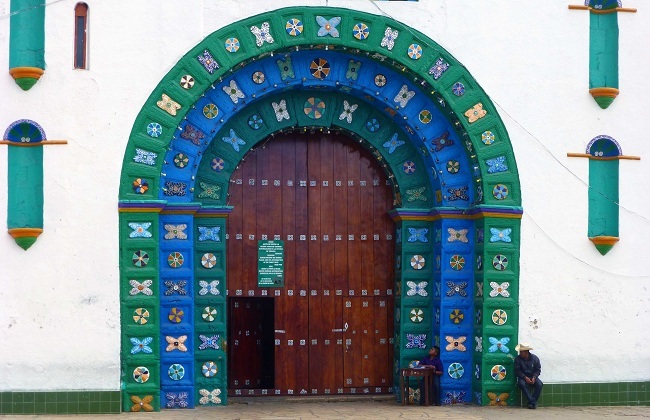 Have you been to San Juan Chamula? What do you think about their unique religious practices? That is one of the most incredible things I have ever heard of. I love how even though religions are the same in many countries, they express it and pray differently. The pine needles and candles must have added an amazing effect to the church. It is unfortunate for the chicken though. As soon as I saw the title of the post I new this was the church you were talking about. I visited it about 9 years ago and was mesmerized…almost unreal. Too bad images are not allowed right? Hey Federico – It is a shame about the photography but at the same time, I think the atmosphere would be completely different if everyone was taking photos. So in the end, I can understand and it’s fine with me. Quite a place though! I always find it fascinating how ‘old’ cultures incorporate ‘new’ things into there traditions. The scene in the church must have truly been an impressive event to witness. Hey Andy – I think about this very often as I try to take as many photos as I can, mostly so that I can put them on the blog, but at the same time, I do prefer seeing the world through my eyes, not the camera lens. It’s a tough battle I say. A lovely story and a great picture. If the man wasn’t sitting there I would not hav appreciated the size of the door. Fabulous!!!! Hey Liz – That door was huge and I was happy that they let us at least take a photo of the outside of the church. What a unique experience. It’s as if you’ve stepped back in time, before photography existed. It’s great that they’re open to letting travelers in. I hope that reincarnation exists for the sake of the poor chickens being choked. Hey Mike – It is a step back in time and the amazing part is that it seems as if nothing has changed at all in many years inside that church. Others have commented that what I described is exactly what they saw some 10 or 20 years ago. Not sure about the chickens though…I’ll have to try and find out what happens to them. Yes! I have to agree that is the most amazing church – it is gorgeous! I can back up everything that you just described! I have been to San Juan Chamula twice and it has always been a truly spiritual experience to be inside the church. The second time I went, there were two “topiles” (the ones in the wool poncho) removing the film from a girl’s camera who had taken some photos inside the temple. I am so glad that you are visiting all those amazing places in Chiapas that are not seen by just anyone. Continue having fun in the beautiful southern states of Mexico! Hey Lalo – It’s a shame that Chiapas is a bit difficult to get to but at the same time, it was quite nice that it wasn’t filled with too many tourists. And we tried plenty of chocolate and mole during our stay in Oaxaca! Hey Queenie – Very nice to know that you enjoyed this place so much as well! How fascinating. Bet lots of those folks get relief too. Aren’t the Zapatista’s in Chiapas as well? Hey Randy – Yes, they are but these days there isn’t much going on in terms of conflict. And these folks have an interesting relationship with the Mexican government apparently in which they accept certain benefits but refuse others. @BeautyInMess – Then you should definitely travel here soon! Wow, that is quite . . . interestingly full on, would have been an amazing experience. I wish I visited while I was over there, maybe at the beginning of next year when I am over that way. What do they do with the chickens? Because surely if they fed these to people they would be tainted with some evil, evil things. Hey Jaryd – That’s a good point although their logic isn’t exactly the same as ours. But in all honestly, I’m not sure what they do with the chickens after killing them. Maybe they sell them to the neighboring villages that don’t practice the same religion. Yes! Such an amazing place, what I remember most was the earthy, herby smell of the insence which I found so indescribable, adding to the mysticism of the experience. SARAH: Your description of the incense reminds me of an experience I recently had after walking into a huge, almost vacant mosque. Hey Sarah – That incense mixed with the pine needles created such a beautiful aroma. I can still smell it when I imagine myself there. You know what? NOT seeing it makes me want to go more! Hey Maria – I can see how that would be the case…so, when are you going???? P.S. Earl, are you at all talented at sketching? I was wondering if you wanted to sketch the interior of this extraordinary church. Hey Kenneth – Unfortunately I have no sketching talent at all. For someone who does though, I can only imagine they would be able to do a great job of showing what was inside. That part of Mexico sounds fascinating and the church must be absolutely transcendental. The only thing I didn’t like was the strangulation of the chicken (I’m a vegan, but I don’t preach it like a religion!). Mexico still remains so mysterious to me. Keep writing. I really enjoy it. I’ve been to Mexico several times (day trip to Tijuana in 1983, day trip to Tijuana in early 1993; a trip with several college friends in the autumn of that same year; a journey from Las Vegas to San Diego via LA that necessitated the use of the SD trolley to get to San Ysidro where I went through the turnstile; after moments of speculation and anxiety, I found the bus to Tecate, and once in that city, I transferred to another bus to Mexicali; in the early ’90s, a train traveled between Mexicali and Guadalajara. This journey took forty-four hours and cost US$27.00. Although I fondly remember it as a solo adventure those two days inside a carriage where I sat on ragged plastic seats and felt the breeze of the Sonora night strike my face as the shattered windows offered me no protection from the elements; Vendors came aboard selling cola and tortillas. I had the chance to practice what was then my rudimentary Spanish with my fellow passengers. During the day, I saw magnificent desert scenery that resembled the landscape of Mars. At night, I could see lights illuminating the cities and resorts that looked out across to the Baja Peninsula. I finally arrived in Guadalajara at night two days after starting the trek. The train to Mexico City was the polar opposite. It was air conditioned; its seats were comfortable and intact, and I was the only passenger in the cabin. I arrived in the capital the next day and walked more miles than I probably ever had in my life. It didn’t hurt as I was an overjoyed college kid who had reached his goal despite discouragement from others. After two days in the capital, I took a direct coach from Mexico City all the way back to Tijuana, and then proceeded by Greyhound to my college town. To some, this might sound insignificant, but it changed me. It gave me confidence; it nurtured my desire to explore, and it finally gave me a chance to see the diverse landscapes that comprise Mexico!). I went back the following year when I took a bus from Tijuana to the capital, and another connecting bus to the very south where I could cross the border into Guatemala. That foray was not as successful as I had anticipated, and I finished the trip by flying home with a ticket purchased on my credit card. I didn’t go back to Mexico until 1999, when I flew from Tijuana to Monterrey, and onwards to Havana (the statute of limitations has expired, so this American can’t be prosecuted for spending money in Cuba!). I got into a bus destined for the airport, but the windows were so scratched that I had no idea where I was. Finally, I got out and could not see anything resembling an airport. I put out my thumb and a kindly Mexican family drove me to within walking distance of the airport —-once again, another random act of kindness I experienced in Mexico among many others. After moving back to the Southwest, I decided to practice my driving (I had just gotten my license finally! ), and ended up at the border in Nogales. I walked over the border that night and walked a while before unease set in (Nogales is nowhere near as animated as Tijuana is at night). I went to the parking lot on the U.S. side where I paid for my two-hour stay and drove back home on a beautifully lonely highway! I went back by Tufesabus the following week and it took me over the border all the way down to Hermosillo, where I caught a bus for the one-hour trip to Bahía Kino. Both places were pleasant, but they did not compare to the splendor that is the capital of Mexico. I decided that the marvels of Mexico had to be shared with someone, and so, in 2008, I flew with my wife to Mexico City. It was the trip of a lifetime. We explored the shrine to the Virgin of Guadalupe. We scaled the pyramids of Teotihuacan. We visited numerous museums, including ones that featured the works of Orozco, O’Gorman, Kahlo, Siquieros (sp? ), and Rivera. We attended the dance ceremony at the Palace of Fine Arts. Good restaurants were never hard to find. We also investigated several other landmarks. It was one of the most rewarding trips we have ever had. I am sorry for rambling on about my own experiences. I really enjoy your blog, and I hope that more people read it, take an interest in Mexico (as well as other places), and see for themselves that it is not as dangerous at they may think. Keep up the good work. You’re enriching your life by seeing the world, contributing to the tourist industry of developing nations, and forming new friendships, and probably gaining new perspectives on your home country. You should never have to excuse your travel addiction as you’re harming no one. I particularly liked the article you wrote about being perceived as a “bum” for deciding to travel the world. It was very reassuring. I can’t wait to see more posts. By the way, have you travelled much in South America. Last summer, I nearly destroyed myself physically by travelling across every South American nation and the Department of French Guiana using only buses, trains, and one overnight boat. It wore me down, but I will never forget it. Take care, fellow traveller! What an incredible experience. Did they say what happens to all the afflicted chickens?! Hey Charli – After they are killed I’m not sure what happens to them. With their interesting rituals I wouldn’t be surprised if they just ate them! The sights and the smells connected to having fresh pine needles on the floor and then candles throughout must just be amazing. Thanks for sharing this incredible place. Even your description is unforgettable – I’m sure the experience is even more so! Hey Bessie – The pine needles on the floor was just brilliant…such a simple way to create a unique atmosphere that really affects all those who enter. It was a beautiful experience visiting the church, very special. The number of candles blew me away. Hey Rashelle – I think all of those candles on the floor was definitely the most striking aspect of that church…amazing what kind of atmosphere a few sticks of wax can create. Glad you were there to share the experience! Oh my. I often feel a little uncomfortable taking pictures in churches anyway…this just takes it to a whole new level. Sounds amazing, though. Definitely something to be experienced oneself. Thanks for sharing! Hey Sam – It was interesting here because even though I couldn’t take photos, I didn’t mind at all. It would have seemed very strange to pull out a camera with all of this stuff going on. Definitely putting this on my list of places to visit when I’m living in Mexico next year. Thanks. Hey Mzuri – Glad to hear…you won’t be disappointed! This ranks right up there with bizarre but true stories I’ve heard. I can appreciate why they wouldn’t want you taking a photo inside. Is anyone allowed to go inside? Hey Leigh – Yes, anyone is allowed to enter, after paying a small fee, but just no photos. I have also visited this church, but it was 24 years ago. What you have described is what it was back then. Of all my travels around the world, this is one of the most interesting ways to be religious. We were so overwhelmed by what we had witnessed, that it was almost unbelievable, that this could still be in practice in this day in age. That experience is still part of my “bag of travel stories” to this day. Even though it’s been along time ago, I still remember it very clearly. The one thing you didn’t include was the amount of smoke inside the church. The smells, the smoke drifting obscurely through the candle light and the chants all still bring a chill to my spine just thinking about it. I highly recommend this side trip to anyone traveling through this part of Mexico. Thanks for the memory Earl. Hey Steve – I have no doubt that little has changed inside that church since your visit. And yes, there was a decent amount of smoke inside the church as well. There were also a few men on scaffolding cleaning the soot from the walls with large mops and the amount of black stuff they were collecting was incredible. The first time I entered that church was in July last year and I regretted not having any talent to draw as I would have drawn the scene from memory after having left the church. For someone who’s seen it with her own eyes, I can say that you’ve described the scene quite faithfully and added interesting facts about it that makes it even more appealing. 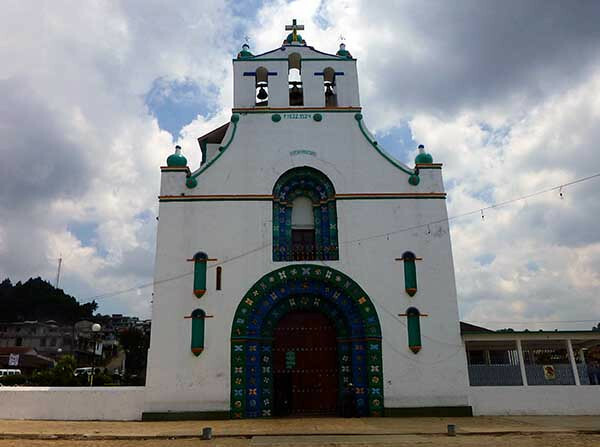 I truly hope lots of people will live the experience of stepping into the church in San Juan Chamula and understand the Tsotzil people’s ways. @Les Petits Pas de Juls – No drawing skills over here either…that would have been a good way to keep a record of what I saw though. Hi Earl, thank you for sharing this amazing story. Were the chickens kept in a cage before the shaman deliver them to the next life? Hey Lien – The chickens were just sitting on the floor in plastic bags next to the families, with their heads sticking out of the bag. All the amazing things you can see in the smallest little towns. Around every corner there is an intriguing surprise. All you have to do is open the right door. Nice article WanderingEarl. The article inspires the idea to travel there immediately, and is one more place added to my never ending list. @Passport Dave – Let me know if you go…it’s well worth the trip!